Citation Information: J Clin Invest. 2018;128(1):294-308. https://doi.org/10.1172/JCI92513. GDF6 is recurrently amplified and specifically expressed in melanomas. (A) Circos plot displaying gene copy number gains and losses of zebrafish melanomas across 25 chromosomes. JISTIC G-scores are displayed as pale red shading (amplifications [minimum = 0; maximum = 1,550]) and blue shading (deletions [minimum = 0; maximum = 2,150]). –log10-transformed JISTIC Q-values with a cutoff of 0.6 (corresponding to an untransformed Q-value of 0.25) are shown as bold red lines (amplifications [minimum = 0; maximum = 11]) and bold blue (deletions [minimum = 0; maximum = 11]). Dotted circles represent the –log10-transformed Q-value of 0 (center) and 11 (outer: amplification; inner: deletion). (B) Venn diagram of orthologous genes significantly amplified in human and zebrafish melanomas from a total of 10,380 human-zebrafish gene pairs (hypergeometric test, P value: 2.0 × 10–15). 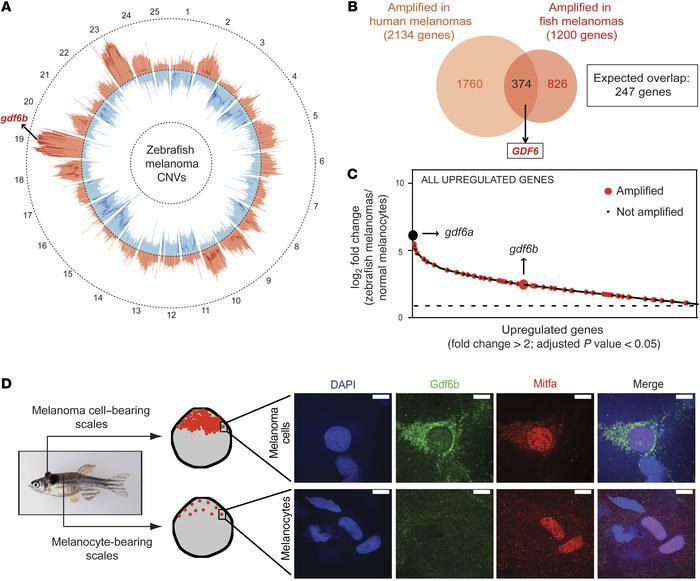 (C) Genes significantly upregulated in zebrafish melanomas as compared with melanocytes (microarray data set) are plotted in order of their fold change. Only genes with a fold change of greater than 2 and an adjusted P value of less than 0.05 are plotted. Recurrently amplified genes with amplified human orthologs are indicated in red. gdf6b (large red dot) and gdf6a (large black dot) are indicated. Dashed horizontal line represents a fold change of 2. (D) Immunostaining of Tg(mitfa:BRAFV600E);p53(lf) zebrafish scales bearing melanoma cells or normal melanocytes. DAPI (blue), Gdf6b (green), Mitfa (red), and a merged image of all channels are shown. Mitfa antibody specificity is shown in Supplemental Figure 2B. Scale bars: 10 μm.